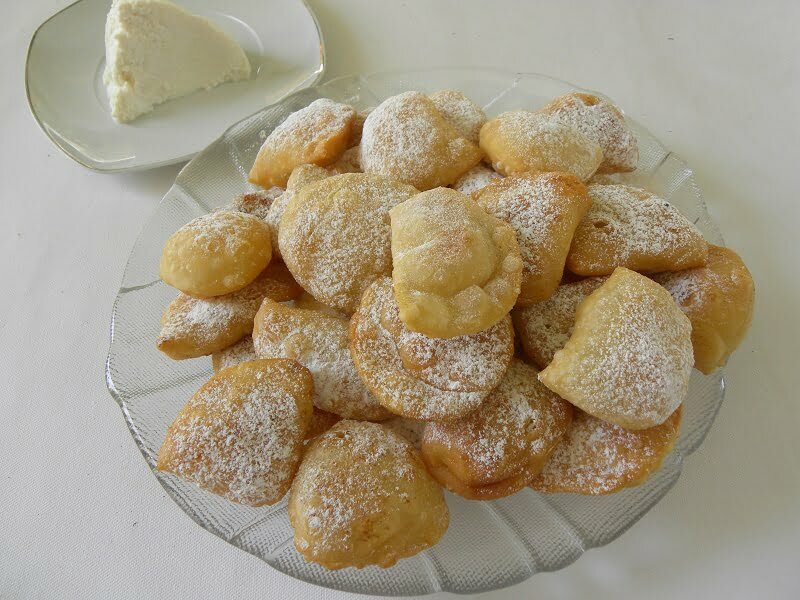 Bourekia is a pastry made with a thin flaky phyllo, and are filled with anari which is the Cypriot name of the cheese, which is similar to anthotyros or ricotta. Anari is a white soft whey cheese which is produced when making halloumi or kefalotyri. It has a delicate, creamy flavour, slightly sweet, which makes it perfect to use in both sweet and savoury pastries or other desserts. In this recipe the cheese filling is sweetened and flavoured by adding sugar, cinnamon and orange blossom water. If you cannot find anari or Greek anthotyros or myzithra, you can substitute it with Greek manouri or with ricotta. In Crete bourekia are called kaltsounia. You will also find similar pastries with different names, such as turnovers, empanadas, calzone, borek, samosa etc. They can also be made savoury as well with other kind of cheese, such as halloumi, graviera or feta but also filled with minced meat, mushrooms, spinach, pumpkin, potatoes or other fillings. During Lent you can make a different kind of Bourekia Nistisima (Lenten) by filling them with store bought halvas. To make Bourekia you must first make some homemade dough. After the dough rests for about half a hour, roll out a thin phyllo sheet. You can roll out the phyllo, the traditional way with a rolling pin or if you have a pasta machine, you can roll the phyllo much easier. Add a tablespoon filling, between each one leaving some space between each one. Then brush the empty space with olive oil or vegetable oil and cover them with the phyllo. Press the gaps with your finger in order to stick together. Cut it using a drinking water glass starting from one end to the other to form semi-circle pastries. (Traditionally they are cut with a water glass but we can cut them with a knife and press the edges with a fork or use a ravioli cutter). At this stage you can freeze them. Put them in a tray, adding cling film between each layer. When they freeze, you can empty them in zip lock bags. Fry them without thawing them. Put them on kitchen paper to absorb excess oil and served them with some icing sugar on top. The recipe is included in my cookbook Mint, Cinnamon & Blossom Water, Flavours of Cyprus, Kopiaste as well as in Volume 2 of my e-cookbook, sold on all Amazon stores. Prepare the dough and set aside to rest for half an hour. To make the filling, crumble the anari with a fork and mix all ingredients except the icing sugar and make a fluffy mixture. Roll out the dough into a thin sheet of phyllo and place one tablespoon cheese mixture, leaving a gap of about 3 cm (or 1 inch) and continue to fill the pastry. Wet the gaps with olive oil and fold the pastry over the filling to enclose it completely. Press the gaps with your finger in order to stick together and cut it using a drinking water glass starting from one end to the other to form semi-circle pastries. Heat the oil and fry the bourekia on both sides until golden brown. Place on kitchen paper to absorb the excess oil and when they cool, sprinkle with icing sugar on top.